The Aberdeen Unitarian Church owes its existence to a small group of liberal thinkers who in 1833 invited the Rev. Archibald MacDonald of Greenock to conduct Unitarian services in the city. These were enthusiastically received and a Congregation was formally established on Sunday 13th October, 1833. An architect, J.S.Simpson, was commissioned to produce a plan of a new church building, which was subsequently dedicated as a "Christian Unitarian Church" on 9th August, 1840. It was "an elegant building, in every way fit for public worship". Its interior dimensions were 50 x 43 feet and 133 members took "sittings". The building cost 859GBP and much of this sum was raised by the minister, Rev. J. Cropper, who travelled widely in England and Ireland, seeking financial help for the Aberdeen cause. This building was the home of the Congregation until 28th May, 1905, when it was sold to a firm of undertakers for 2000GBP. Nothing now remains of the facade of this original church. The site is now occupied by a menswear shop. It is appropriate to highlight the ministry of the Rev Alexander Webster (1884-1891 and 1895-1910) who in his first period as minister of the Church instigated "Fresh Air Fortnight" holidays for deprived children of the city. Within the first year hundreds of children were given country holiday opportunities. Within 20 years a cottage was purchased at Peterculter and this evolved into The Home for Ailing Children and what is now Linn Moor Residential School . When the Rev. 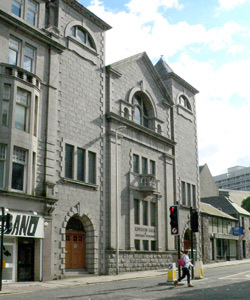 Webster embarked upon his second Aberdeen ministry he dedicated himself to creating a more comfortable and commodious building. By 1906 his dream had been fulfilled. The Congregation took possession of its new building at the corner of Skene Street and Rosemount Viaduct in July 1906 and the service of Dedication took place on 23rd September, 1906. The architects were D.& J.McMillan and the building and its furnishings cost 7370GBP, of which 1720GBP had been raised personally by the Rev. Alexander Webster on extensive fund-raising tours of the United Kingdom and the United States. The building consisted of a large, spacious church with gallery and organ upstairs and a fine hall, smaller rooms and kitchen, downstairs. The church boasted some fine woodwork, including a vaulted pitch-pine ceiling, an impressive pulpit and fine panelling. In this new home the Congregation flourished, enjoying an enlarged membership (189 in 1906), increased prestige in the city, and during the ensuing years, some very distinguished ministries. It had proved to be everything its founder, Alexander Webster, had hoped it would be, a worthy home for a vigorous, free-thinking Congregation. However, the financial burden of maintaining a large granite building in need of renovation was beginning to tell on the Congregation in the 1980s, and so the decision was made to seek a less costly building. Eventually an exchange was agreed with the Jehovah's Witnesses who owned a more compact and modern building in the next street, Skene Terrace. Thus the Jehovah Witnesses moved into the Alexander Webster building in 1987, renaming it Kingdom Hall. The building was opened by a small sect, the Church of Christ in 1909. It has been used by several religious denominations over the years and is well-suited to the needs of a smallish Congregation of modest means. The Congregation took possession of the building in July 1987 and it is held in Trust for the conduct of public worship. A new electronic organ was installed at the time. It provides compact and comfortable accommodation consisting of a multi-purpose worship space, kitchen and toilets downstairs and a recently refurbished smaller meeting/quiet room upstairs. In September 2013, members of the congregation participated in Edinburgh in the 2 day celebrations for the 200th anniversary of the founding of the Scottish Unitarian Association (SUA) and the passing of the Trinitarian Act by presenting a historical insight in music, song and speech entitled "1813-an' a' that". This was written by past Aberdeen Church Secretary, Bill Stephen. The previous day, a Civic Reception was hosted by Edinburgh City Council at the Council Chambers. After a period of years of having no minister, the Rev Caroline Cormack was inducted in August 2016. August 2018 saw a commemorative service held in the presence of the Lord Provost, local politicians family members and a representative from VSA who run Linn Moor School for the 100th anniversary of the passing of the Rev Webster. At the time, his gravestone in Old Meldrum churchyard was cleaned and re-erected by the family. The commemorative service was followed in January 2019 by a Civic Reception hosted by the Lord Provost to celebrate the life and work of the Rev Webster. Speakers were the Lord Provost Barney Crockett, Mrs Joan Cook, President of the General Assembly of Unitarian and Free Christian Churches, Rev Caroline Cormack, Dr Mike Taylor, Rev Webster's great grandson and Kenneth Simpson, CEO of VSA, Aberdeen. Around 50 invited guests from the congregation, family, the local political scene, VSA and other organisations that recognised the political and socialist work of Rev Webster were present.